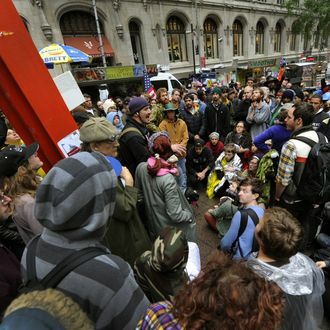 Occupy Wall Street protesters gathered outside of the Manhattan Federal Court building this morning to announce a lawsuit against the city, Michael Bloomberg, and the NYPD for the raid last fall on Zuccotti Park that effectively stamped out the movement’s momentum. Literally, it’s about the goods they allegedly lost during the seizure, including more than 3,000 donated books, a.k.a. the People’s Library, and other equipment totaling $47,000, but the suit also questions the constitutionality of the eviction. They claim the books were returned damaged, or not at all, and Howard Zinn just doesn’t have the same kick on a Kindle.